The following events are all true. No stunt doubles were used, yes there were injuries and quite a few deaths along the way. Caused by me, happened to me and most definitely was there laughter and crying. Settings: Kain (Raptor) Vs Randy & Ashton (Humans/Aliens), Pistols, Shotguns, Bows and club only. So there I was, running around like a fool, having the time of my life with the raptors increased speed and massive jumping abilities, my cousins looking for me. So far they're having trouble killing me unless I intentionally do something foolish like attack them head on or go right out in front of them. Well out of boredom, I climb onto the top of a crate and just sit up there. Eventually I just start clicking both the movement stick and the camera stick back and forth in the same direction repeatedly, which I soon discover, much to my amusement for the next few minutes, it makes my raptor dance. So there I was, on top of a pile of crates, dancing and singing. "I'm just a love machine~. And I won't work for nobody but me~. YEAH BABY!" So caught up in my show I didn't notice that they had found me and the end result was them getting a point for finally killing me. Now I had a source of entertainment. Every time I found a stack of crates, I would climb to the top, start dancing and singing. It got to the point where the moment I began to sing, they would mumble "He's on a crate." and begin looking for me. Well this worked well for my advantage. They would be so focused on looking on top of crates for a dancing raptor that they wouldn't be paying much attention to the ground around them, not realizing that a certain disco raptor was doing the boogie behind them. Haha, sounds funny! Did you sing "Staying Alive" at all? Are you going to do it again? 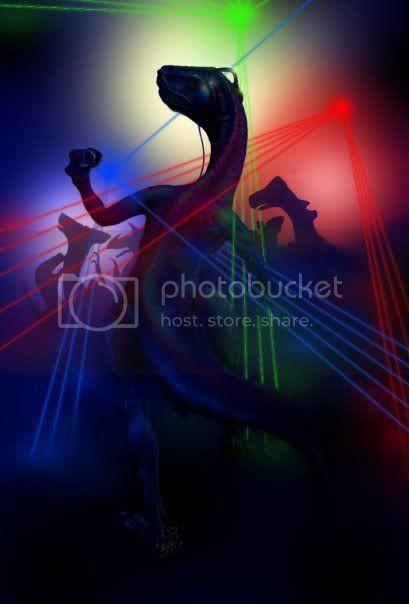 Anyway, go Disco Dino! Oh wow that's the funkiest strategy ever! Not on too often, but I'm still here! Time for another adventure from the mind of an insane Overlord. Kain (raptor) vs Randy (human) and Ashton (alien). Settings: Pistol, Shotgun, Club and Bow. This time I was in the jungle. Trees, tall grass and lots of hiding spots everywhere for a sneaky raptor like me to hide and ambush people...or so I thought. Come to find out, this stage had NPC dinosaurs that would attack EVERYONE. So there I was, sneaking through the grass because that's just what I do, when suddenly I'm pushed and taking damage. I turn and look, I see nobody. Suddenly I get hit again. Not knowing what is happening, I make a mad dash to find some cover behind a giant boulder. Again I get attacked! 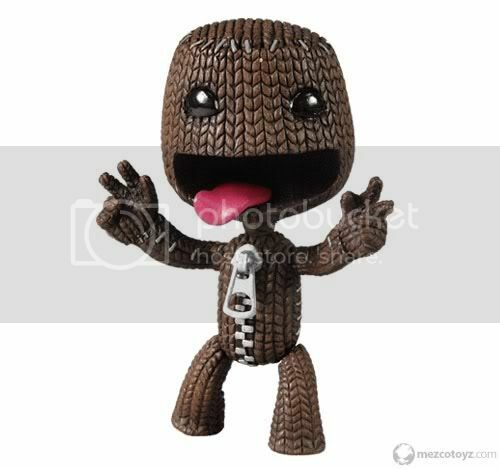 Now I'm considerably freaking out and I began to claw wildly and jump like a maniac all the while shouting and screaming. "Get back! Stay back foul beasts! I DON'T BELIEVE IN YOU~!" On the outside, it must have looked hilarious. 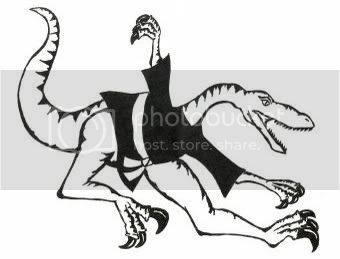 A raptor hopping up and down in tall grass, swinging wildly at something. Then before you know it, I'm near death. "Oh god no!" I cry as I turn and run out of the tall grass into the open, only to find myself staring down the barrel of a shotgun. "NOPE!" I cry and run back into the grass, barely avoiding shotgun fire as I disappear back into the brush. Suddenly I'm ambushed and taken down by the dinosaurs again. "Well that plan went to hell fast..." I mumbled to myself as I respawned. "But lessons are hard learned!" I shouted as I ran back to the grass and began to take revenge on the raptors that killed me. At this point, Ashton and Randy had finally ventured into the grass to try and find me, so I had many sneak attacks pulled in there. If they saw me, I would make a mad dash around the grass going "WHOOP WHOOP WHOOP WHOOP WHOOP WHOOP!" like Zoidberg from Futurama or more classically known Curly from the Three Stooges. This continued for awhile until they finally managed to chase me out of the grass and into more open areas. So I ran, zig zagged and hid behind anything I could, all for naught because they would quickly catch up and take a shot at me. Now, there was a cave we had found awhile back. I'd only gone into it once before since the only way back out was through the way you went in and it was a maze of tunnels, however there was also a pit that even the raptor could not jump out of, I found out the hard way much to my annoyance. I was making a dash for that cave when I noticed a small mound up ahead with some grass and trees on it. Without a second thought, I ran in back and climbed up on top of it and stood there dancing again. Suddenly I stopped the moment I saw Ashton but he hadn't seen me, instead he ran right passed me and around the bend towards the cave. A few seconds later and Randy came by as well. I jumped down from my perch and followed after, not sure what I should do at this point. Suddenly, the both of them were stopped in front of the cave and were keeping a close watch on the entrance, I slowly walked up behind them. "Did he go in there?" Randy asked suddenly. "I don't know, I didn't see him." Ashton replied as he took a step to the side to get a better view into the cave. "Well I don't know who we're looking for but I haven't seen anyone." I replied. "HEYYYY!" they both cried and tried to quickly turn around, only for raptor Kain to start whooping like a madman and dash between the two of them into the cave as they turned around only to miss me completely. Just goes to show, never underestimate the power of a ninja. You're quite the story teller Kain! Settings: Expert, Single Player Campaign. Character: Nick. Weapon: Combat Shotgun, Katana. Things were going terrible in this stage. After many frustrating restarts and deaths, I was finally making my way through the sugar mill towards the safe house. I was alone. My team had long since been killed and it was just me, my shotgun, 56 HP and a crap load of zombies. Now to those who don't know, the sugar mill is infested heavily with Witches. To those who don't know what the Witch is, she's a female special infected who has two poses. In one, she sits in an area and sobs. In the other, she's up and walking around while sobbing and is actually less hostile. What makes her so threatening? 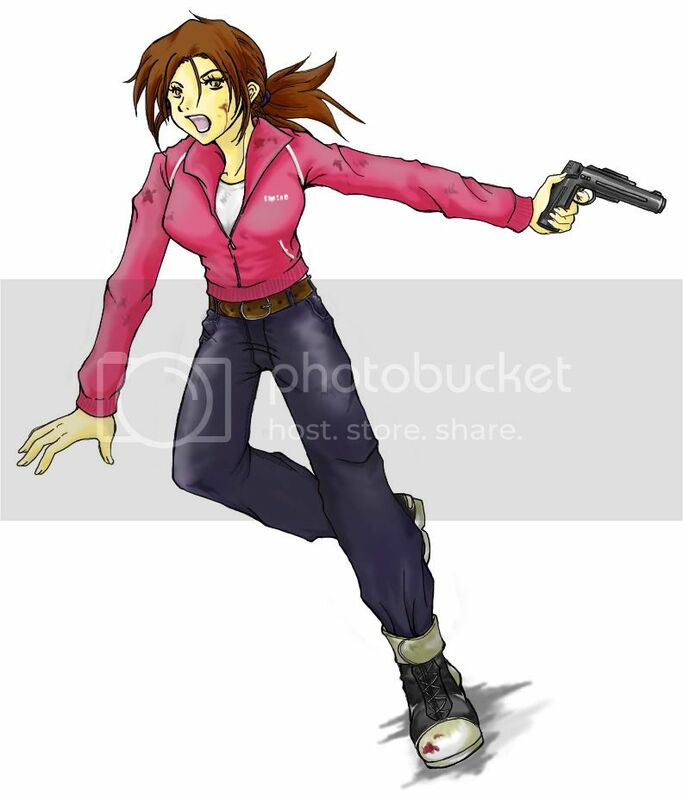 If you piss her off (Being in her vicinity too long, shooting her...etc.) she will immediately attack you, the worst part? She's faster than any zombie in the game, she has a LOT of health...and she can instantly kill you if she hits you, and the sugar mill is one of the areas in the game that lets you encounter multiple amounts of them in one go. So as I was running through a ton of water in pouring rain (water makes you move slower and puts out fire, obviously.) I found a witch sitting in a puddle, and two of them were walking around the area. If that wasn't bad enough, the most sinister, kick @#$ and frightening music you could ever hear in your life starts playing as a Tank (a special infected who looks like a zombie on steroids that can easily fling a car around.) starts running towards me. If that wasn't bad enough...his hillbilly cousin the Charger (A giant, overalls wearing zombie with one huge arm that rams into you, grabs you and slams you until you're dead.) had also spawned in and was trying to attack me. I quickly pulled out my molotov and flung it down on the dry ground in front of me and began to quickly run back while taking shots at the Tank and Charger. This was made extremely difficult to fight because I had to watch out for rocks from the Tank, the Charger to rush me and to avoid shooting the witches. Unfortunately for me, Tanks get a speed boost if they're set on fire, fortunately for me, they are slowed down in the heavy water. The Charger had finally gotten taken down from being set on fire too long. The Tank was still trying to get close and hit me or stopping to try and throw a rock at me, which I would quickly dodge by hiding behind a pole or something to block it. Finally...my last shot vanished from my gun and it was down to the katana. I was pretty much ready to give in right there because I had serious doubts about being able to kill the Tank. He ran up to me like a hound of hell and I just mashed the fire button and swung my sword like a madman. I get smacked, I get sent flying, my health has dropped from 56 to the red. I wasn't sure where at. I quickly took out my adrenaline shot, gave myself the slight speed boost and 15% health boost and when the Tank got up to me, I took two more swings and suddenly...he fell over and died. I couldn't believe I had just done that. I had fended off a Tank and a Charger in heavy water while surrounded by Witches. My luck had increased drastically at this point. I found some pain pills (50% health increase.) and a Scar-H assault rifle. By taking it slow, I was able to get to the safe room, heal myself and my computer partners respawned once I entered the next level. And that is how I got the AI Director to hold a grudge against me ever since. Pic very related...it's the stage I can't even get passed the first level on now because of how cruel and unusual the Director has been. Another chapter from some book I found lying around somewhere. Here's how the story started out. I was in the chapter where you have to fight Nina in her red dragon form. Now she will NOT move from her post, she does NOT have long range and not only does she heal 3 HP per turn, she has 3 elixers on her as well. I went into this match with all my low levels. Mist, Rolf, Soren, Astrid, Mia, Marcia, Illyana, etc. Ike and Boyd were the ONLY powerful units I brought into this fight and they, along with everyone else, was packed down with gear for everybody. Ike having a custom made Steel Sword and Boyd having a custom made Steel Axe as well. Those two alone, cleared the entire way towards the boss. Once I had made it to the boss, I let my lower units run wild. By attacking her repeatedly, letting my healers heal and letting her heal herself, I stayed in this level for well over 200 turns as I did my exploit. By doing this...I got Mia from a level 10 myrmidon to a level 5 Swordmaster, Rolf from level 5 archer to a level 5 sniper, Astrid from level 14 bow knight to a level 5 paladin...so on and so forth until everyone was their next class and at level five. Soren however...sadly was only gaining 1 exp per fight and he missed nearly every single time, so he gained only one level out of this. I even gave him a fire and thunder tome, but it was no use. He just couldn't pull it off. Mist amazingly got to her next level as well as Rhys thanks to this exploit. After this, I hadn't used these units again for a bit. Finally I was at the snow stage where you can fight Naesala, the king of the crows. I had everyone who had power in them attack him in one turn, but he was just 4 HP away from death. I sent Astrid up to him, but saw that not only would she not kill him, but he would kill her in one hit. So I moved her farther away from him. To my amazement, he managed to reach her on the next turn and in my mind, all hell broke loose. 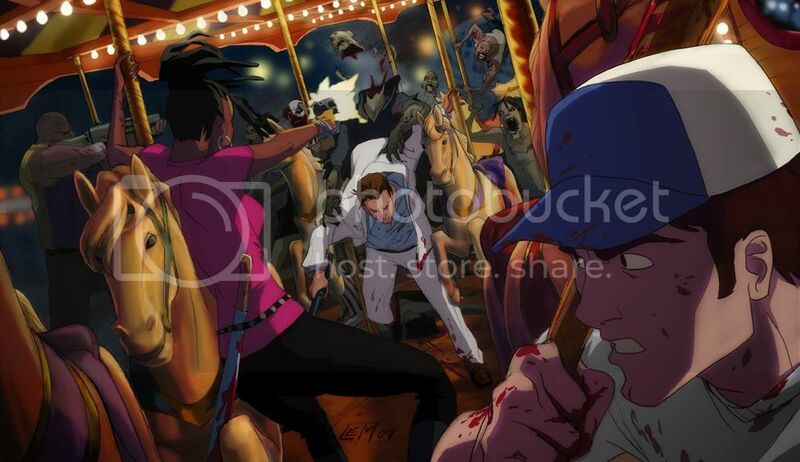 He had two chances to attack her, both at 91% to hit her and just one attack would kill her. "OMGOMGOMGOMG GET OUTTA THE WAY!" I yelled, she dodged! "Yes! Oh god yes!" I yelled and then she retaliated with her sword and did 1 damage. Then I remembered, he had another chance to hit her. "SHITSHITCRAPSHITOHGODSHITRUNDODGEGETOUTOFTHERE!!! ...DO A BARREL ROLL!" I yelled out, and to my amazement, she dodged the attack again! So relieved was I that I had literally sank right out of my chair and lay on the floor. 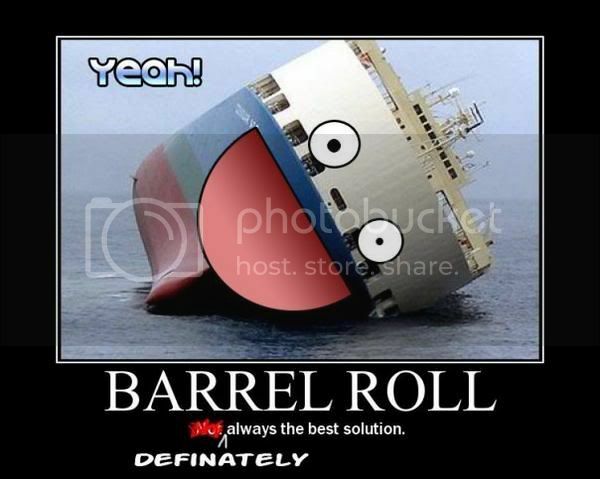 So next time you find yourself in a compromising situation, remember, Barrel Roll is ALWAYS the best choice. Before we begin another riveting tale, I believe I should discuss some information first. Settings: Survival Multiplayer. Monster spawning is on. Armor wasn't working during this update. These things EXPLODE when you get close to them and cause massive damage to, not only you, but the area and anything in it. Anyways...Role and I were on a server, digging around in Kolima Cave. I had gone there to handle some monster problems in exchange for the vast amount of cobblestone they had so I could continue work on my castle. So I had climbed to the top of the area and was laying down torches and lightstone to keep monsters from respawning all the while dealing with the various monsters in the area. Zombies, Skeletons, Spiders and a few Creepers. All I have on me is a Diamond Sword which is nearly destroyed and stuff to put down, I also had only two hearts left. My sword is broken in a few minutes by a skeleton. I was going to leave when I noticed something. 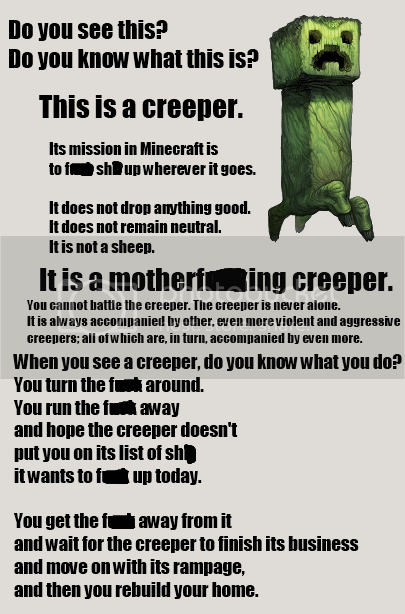 Three Creepers. I was going to shrug it off but then I noticed that they had jumped off of the top area and were heading towards something. My eyes widened. They were sneaking up on Role. I dashed ahead of them and dropped down. Without a second thought, I went Fist of the North Star and began to punch like no tomorrow. Right as one Creeper began to hiss and explode, I punched him back and jumped back at the same time, avoiding the explosion. The next two Creepers were still running towards me, so I resumed my barrage of fists and took down the second before he even got within range to explode. The third one got close and began to hiss, I gave him another punch but I hadn't jumped back in time and took some damage. Amazingly, I still had half of one heart left. With the threat averted, I laid down some more torches and left Kolima to restock and heal myself. Just goes to show, sometimes being a hero works out. So I'm talking with some friends of mine and we all decide to meet up in a lobby on L4D. Now the bad part of this is, there was five of us, and only four could be on a team at a time. So we went into a group chat and they went onto a team with each other while I went onto the enemy team. as the match started, we all agreed to help each other out, so I tried to attack them as few times as I could while helping them back up if my "teammates" incapped any of them. Later on, we got to the level where the survivors have to run from the bottom of the hospital all the way to the rooftop. On this run as a zombie, I got the Tank. Instead of wiping out the survivors like the Tank is supposed to do...I escorted the four of them all the way to the safe room. 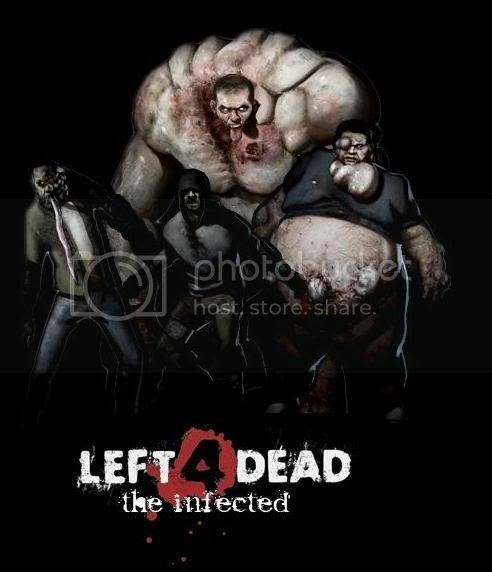 My team tried to stop us, but because I can just smack them and kill them instantly, they had no chance of taking them down, especially with me in front of the charge, wiping out most of the common infected with a few swipes of my muscular arms. Now unless we couldn't help it, the five of us ALWAYS made it. Out of my team, I was usually the only one to make it. Finally we got to the finale. On this, we had to get on the rooftop and call for the escape helicopter. My team played as infected first. One of them had gotten the Tank and I did my best to help out in killing him but the infected don't do much damage to each other so responsibility fell mostly on the survivors to deal with him. Once they had managed to get upstairs and actually summon the helicopter is when I started to show actively hunt down my team and kill them. Even on times when I had gotten the Tank, because the chopper won't show up if neither of the two Tanks dies, I would just jump off of the roof and die. Once the vehicle arrived, I had respawned as a Hunter. The four waited by the chopper for me to jump on and then they all jumped in and we took off. Now the hilarity began as it was my teams turn to play survivors. Just as we got upstairs and were running down the hall towards the roof, the Tank spawned for them. Suddenly over my mic, "Kain. Run passed me." so I did. My teammates shouts of "WTF!?!" nearly deafened me as I had an evil smirk on my face. My friend managed to kill my entire team by himself as I alone got to the area, activated the escape vehicle and held off against the tide of zombies that rushed me. My infected friends did their best to help, but once more, they could only do so much and it fell to me to be able to survive this. However, I got passed both incidents of the zombies and when someone would get the Tank, we would all stop and just mess around. Running laps around the area, jumping up and down while spinning and other random things. Finally the helicopter arrived and since it was just me alive with a Smoker, a Boomer, a Hunter and a Tank, I had to wait for them to all get on the vehicle first or else they would get left behind. Once all of them were squeezed inside, I jumped in and we took off. Just goes to show, people can have friends in the most unlikely of people. Do I have to do everything? Settings: Blood Harvest on Expert Multiplayer. The last stage of this map is the most frustratingly difficult for some reason. There was me, my dad, my cousins Randy and Ashton, we had two 360's linked together and were playing like that. After a few restarts from getting killed repeatedly, we finally made it to the farm house. After much arguing over WHERE to hold up against the horde, I finally won the argument and said we should be on top of the barn. There's only two ways in and we'd have our backs to the wall and we're right next to a pile of ammo. So after we stocked up on items, healed and reloaded our weapons, we went up to the barn. Me with my auto shotgun crouched and took the front with Randy next to me. Everyone else had M16 Assault Rifles. As we were going, I told them pick one spot to defend and do not let ANYTHING get through. What happens? Two of them are nearly dead. That is, Ashton and Randy. Finally here comes the first Tank. We run out of the barn because we don't want to be cornered and the three being to fire on him at sight because their weapons have longer range. The Tank climbed up to our spots and we scattered and jumped down. At that close a range though, I began to fire and help out. From the rooftop, the Tank threw a boulder at Ashton and knocked him over. Without hesitation the thing ran towards him and began to smash him into the ground and before we knew it, he was killed. The Tank turned and smacked Randy who was next to him and he was knocked down. Just as quickly, he was on Randy and beating him to death. Once it was finished with him, it turned and launched a boulder at my dad who got knocked down. Right as it killed him off, I finished off the Tank. Everyone was saying "You're not going to make it passed the next horde." They were wrong. I ran back into the barn, reloaded and grabbed some ammo and got into the corner. I held off every common and special infected that dared to climb up after me with unbelievable accuracy for an auto shotgun. I hadn't gotten touched once through the entire thing. Suddenly, they stopped coming and the music for the second Tank started playing. I got off of the barn and kept running circles around the house with my duel pistols out. Pistols have unlimited ammo so I kept going around and taking pot shots at him while I dodged everything. Eventually he died without touching me. I grabbed the pipe bomb from my cousins corpse and right as the escape vehicle appeared I tossed it to distract the horde and jumped inside, taking my spot as the only survivor. 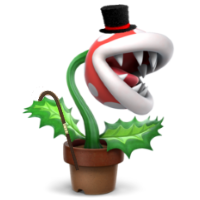 Pic related, it's who I played as. So my cousin Randy buys this game and is after and after me to play it. Now, I wasn't very interested but I decided to humor him and try it out. He let me borrow it for a day and I only got passed the first world because I still wasn't sure how to do half of anything on this game. The next day he wants me to go co-op with him and I decided sure, why not? He takes me to the near end of the game on his own save file and expects me to be some sort of expert for this game simply because I had it for a few hours. Now I don't know the layout of the levels he's taking me on and he's getting frustrated with my constant deaths because we only have so many respawns at a save point. As we were getting to a jump, unbeknown to me, he jumps up and grabs onto one of the swinging things attached to the roof. I jumped late and I didn't get as much height as him and the only thing I managed to nab ahold of were his legs. Now, it is pretty difficult for a new guy to try and swing on a rope while hanging onto someone else and I had no clue he was going to attempt to jump to the next swing as we were because right as he let go to jump at the height of the swing, I pulled back on him because I thought we were going to get more momentum and thus...pulled him out of range of the swing and down to a pit of death. Randy was NOT happy to say the least but despite constantly getting killed and (mainly being the cause of it.) I was having a blast. 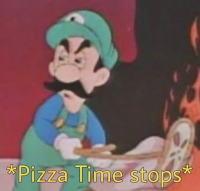 Pic related. It was my face most of the time.